iNew, a well known mobile phone manufacturer in China who’s smartphones such as the iNew V8, which is known for the similar rotate-able camera that can be found on Oppo N1, which is selling hot in China market. 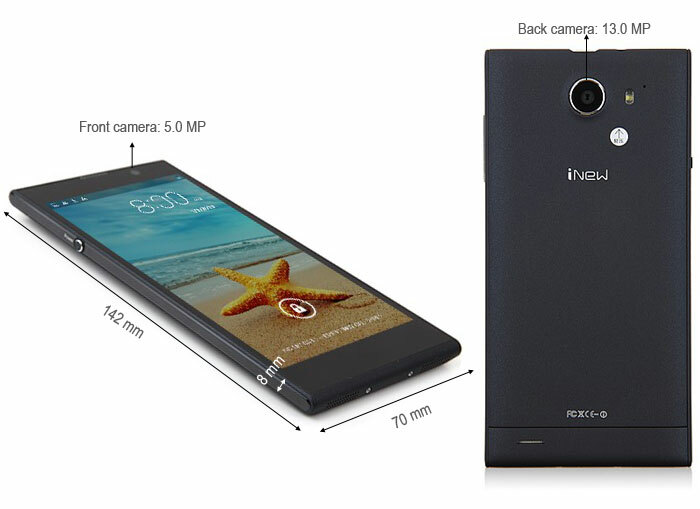 Together with that the iNew V3, an ultra-slim and ultra-light smartphone. The iNew V3 price at 189.53$ according to Gearbest.com. The iNew v3 has a 5.0-inch(326ppi) ultra-sensitive( you can use it even with gloves on or wet hands) IPS screen with the resolution of 1280 x 720 which is categorized as HD display at 16:9 aspect ratio. You get a Corning Gorilla Glass display for optimum toughness and minimized scratches on your screen. It has 1GB of RAM with amazingly optimized 966.37MB of RAM available after excluding the system usage. The internal storage is set at 16GB with 14.66GB available after the system usage as well and on top of that you still get a micro SD slot with support up to 32GB which the micro SD card to be purchased separately. This smartphone comes with a powerful quad core CPU by MTK clocked at 1.3GHz with Mali-400 GPU for comfortable gaming experience. You get a high quality audio coming out from the speakers of the iNew V3 as I compared it with some other smartphones and yes, you get a enjoyable audio quality from this beast. The smartphone has a gorgeous f2.0 aperture 13MP rear camera with Sony Exmor RS sensor packed with dual LED flash powered by Philips. The selfie camera, is set at 5MP enables you to capture top notch photos. The iNew V3 comes with dual sim capability and dual standby mode too allowing you to receive calls/messages on both numbers. This phone does not feature LTE but however you still get HSDPA(3G). The battery capacity for this smartphone is set at 1830mAh which will give a decent 1 day of battery life estimated on average usage pattern. Some additional features that you get from the iNew V3, Motion Unlock where you can wake up the display by simply brushing the display with your palm. Motion Program allows you to launch certain supported application to be activated by simply brushing the display. The iNew V3 comes out of the box with Android 4.2.2 JellyBean and future updates will be supported by iNew itself. Other goodies such as NFC, Bluetooth, water proof display, Gyro,Baro,Light and G-Sensor, USB OTG are also featured on the iNew V3. Feel like want to give it a shot? You can get it from Gearbest.com.